David Ortiz's legendary career has been one for the ages. His story is even more impressive when you consider that the likely Hall of Fame slugger was basically abandoned by his first two major league teams. With the Boston Red Sox, however, he has set a new standard for designated hitters and anchored the team that finally brought a World Series title back to "Beantown" after nearly a century away. In this list of the best David Ortiz baseball cards, we focus on his most popular and valuable cards from the earlier part of his professional career. Shop for Professionally Graded David Ortiz Cards on eBay. 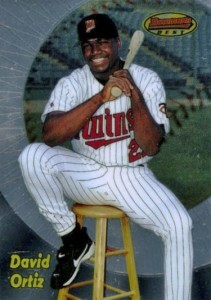 Ortiz was born in the Dominican Republic and originally scouted by the Seattle Mariners who signed him in 1992. 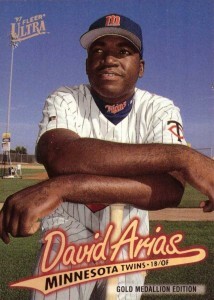 At the time he signed with the Mariners, he used the name David Arias, but after he was traded to the Minnesota Twins in 1996, he began going by David Ortiz instead. 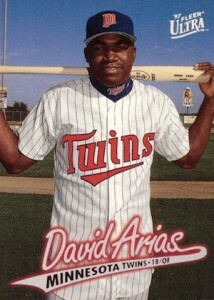 The name change led to some confusion on Ortiz's early trading cards as both names were used. 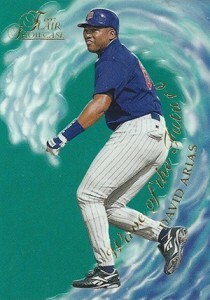 Collectors who are unfamiliar with this may not realize that Arias and Ortiz are actually the same person. When documenting notable cardboard examples in this guide, those that showcase Arias will be noted in the listings as well as seen on the card image in question. 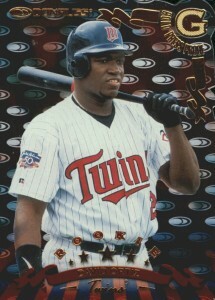 While playing for the Twins, Ortiz worked first base for the majority of his six seasons, but frequent knee injuries made him expendable. When they were unable to trade Ortiz, Minnesota released him, making one of the biggest personnel blunders in baseball history. He was quickly picked up by the Red Sox and moved to designated hitter, where he developed into arguably the best slugger the team has ever had. A member of the 500 home run club, Ortiz supplanted Jimmie Foxx for the Red Sox's single-season home run record in 2006 and trails only Ted Williams for the team's career record. While his regular season numbers are strong, David Ortiz's success in the postseason made him the ultimate fan favorite among modern players for the Red Sox faithful. His bat and team leadership helped the team win World Series titles in 2004, 2007, and 2013, and he has hit an amazing 17 home runs and 60 RBIs during the postseason. With only ten spots to fill, there are plenty of other notable cards for David Ortiz issued over the years. 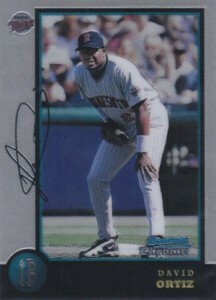 During his time with the Mariners, Ortiz played for their Wisconsin farm team, the Timber Rattlers. 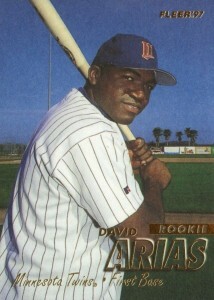 The minor league card maker Best produced several pre-rookie/prospect cards featuring Ortiz, with the most famous being an All-Star card from 1996. Oritz made his flagship debut in 1998 Topps where he was featured on a prospect card with future All-Star Richie Sexson. Boston collectors can turn to the more obscure 2003 Fleer Tradition Update and 2003 Upper Deck 40 Man sets to find Big Papi's first appearances in a Red Sox jersey. More recent Ortiz cards that have proven very popular on auction sites include the short-printed throwback uniform variation from 2016 Topps Heritage as well as his photo variation from 2015 Topps. In building this top list, overall popularity and card value are the two main determining factors. While many Ortiz cards from recent card releases reach high prices at auction, the overall popularity of the first David Ortiz cards from his days with the Minnesota Twins results in those examples dominating this list. The Bowman and Bowman Chrome sets have become synonymous with collectors as the products that feature the first cards of many modern players. 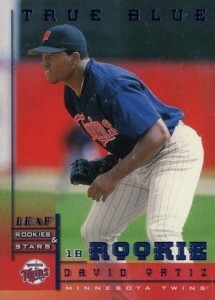 However, Ortiz first appeared in a Bowman set a year after his rookie card. Of course, the Refractors hold much higher values but the base card could serve as a great starting point for collectors looking to begin their Ortiz collection while the parallels offer a compelling chase opportunity. Both the base and International Refractor versions are shown below. Every card in the 1998 Donruss base and Update set received the Gold Press treatment which meant they were gold foil stamped and die-cut in the right corner. These cards are a marvel to hold in your hand as the design can't help but catch your eye. While each card isn't sequentially numbered, the back of these parallels indicate that it is one of 500 copies. Although the 1997 edition of Donruss Signature (check out #2 on this list) features the most expensive Ortiz card available from his rookie year, the 1998 set offers a more budget-friendly alternative. Ortiz reportedly signed 3,400 copies of the base red version and you can also track down other limited parallels, including Millennium green (1,000 copies), Century blue (100 copies) and Previews gold (393 copies). 1998 Leaf Rookies and Stars hasn't really held its value, but several of the numbered cards from the set are among the most valuable early Ortiz cards. The True Blue, limited to 500 copies and shown below on the left, and Longevity (#/50) parallels both offer the same image as the base card with the lettering at the top modified. The main Crusade insert totals 250 copies and showcases a Green foil while more rare Purple (#/100) and Red parallels (#/25) can also be pulled. For some signature collectors, there is nothing like a card featuring that famous "Certified Autograph" stamp made famous on Topps and Bowman products from the 1990s. 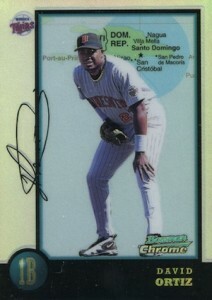 Collectors can find a beautiful card of Ortiz in 1998 Bowman that displays this familiar stamp. It is also worth noting the clear view of his right arm brace that he is now known for adjusting between pitches. Another Ortiz tradition of pointing to the sky after crossing home plate following a home run was in honor of his late mother who died in a car accident. Although the original Flair brand is long gone, the company should be remembered for producing some of the most high-end and technologically advanced cards of their day. The 1997 Flair set presented an ambitious idea of issuing three separate series using different design styles on the same basic card. Ortiz can be found in the Wave of the Future insert at overall odds of 1:4 packs. The captivating card showcases a non-traditional image of David being surrounded by a huge ocean wave. While Ortiz's base card in 1998 Bowman's Best only trades for a few dollars, the Refractors and Atomic Refractor parallels have a healthy popularity and value. Base Refractors are limited to 400 copies and fall 1:20 packs, while the Atomic Refractors apply a prism design and a print run of just 100 copies. These rare parallels are one of the holy grails of early David Ortiz cards. 1997 Fleer Ultra offers two David Ortiz rookie cards for collectors to track down as the set includes medallion variation parallels that have the same card number with a "G" prefix, but contain a different photograph on the front. Along with Ortiz's base rookie card (on the left below), there is a Gold Medallion (1 per pack) and Platinum Medallion (1:100 packs) parallel that rarely appears on secondary markets. 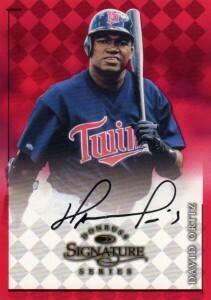 The 1997 Donruss Signature set was the company's first product that offered an autographed card in each pack and Ortiz is one of the key signers. There are 3,900 base red versions of Ortiz's first autograph card and collectors can also find Century blue (100 copies) and Millennium green (1,000 copies) parallels. 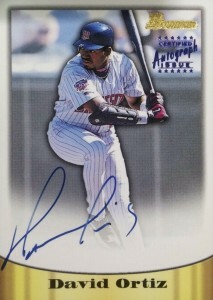 As you can see from the example below, Ortiz signed these cards to the left of the Donruss logo rather than in the signature area at the base of the card, but this hasn't hurt the card's popularity or value. Carrying over from the previous year, 1997 Fleer maintained the matte finish on their cards, which does give them a less vibrant appearance but does not diminish the relevance. The set was configured into two releases with 500 cards in Series 1 and an oddly-grouped 261 cards in Series 2. The David Ortiz rookie card can be found in Series 2 and is the set's most valuable card and main source of hobby relevance. While mint copies can reach prices of over $200 at auction, the glossy Tiffany parallels average 1:20 packs and can yield much higher values compared to the standard version. 2005 Topps Finest David Ortiz Black Refractor 9 25! RaRe! 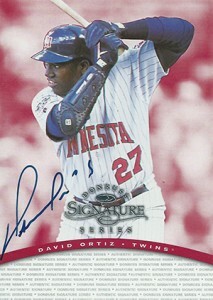 David Ortiz 9 50 2012 Historic Autographs Why The Hall Not? 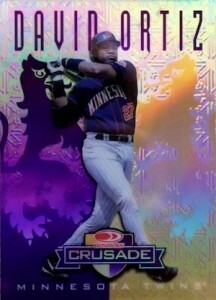 Hello Matt, I have a production error David Ortiz card I am looking to either showcase or sell outright. Any interest or know of someone that may have an interest?